Until 2009, the Frosted and Reticulated Flatwoods Salamanders were listed as one species—simply the Flatwoods Salamander. After the U.S. Fish and Wildlife Service obtained information indicating the Flatwoods Salamander was actually two species, they listed the Frosted as threatened and the Reticulated as endangered. These two salamanders are at risk of losing habitat to rising sea levels, as well as being at risk from drought, which is predicted to become more common because of climate change, and habitat destruction. Drought is particularly problematic for the salamanders because remaining populations are typically limited to single ponds, where consecutive years of drought and drying of the pond can lead to loss of the population. With droughts predicted to become more frequent and intense due to climate change, the Frosted and Reticulated Salamanders are in serious peril. The species separation of the Reticulated and Frosted Flatwoods Salamanders has been found to date back millions of years to a time when the climate was warmer, sea levels were higher and the Apalachicola was an ocean bay rather than a river. This unique history highlights a further vulnerability for the two salamander species-much of their last remaining habitat is likely at risk of being submerged by rising seal levels caused by our warming planet. In response to a 2009 lawsuit from the Center for Biological Diversity, Florida Biodiversity Project and Wild South, the U.S. 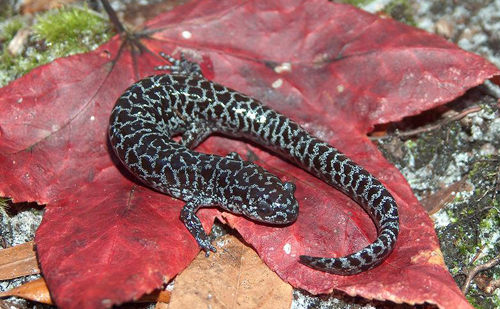 Fish and Wildlife Service recognized that the Flatwoods Salamander was actually two species separated by the Apalachicola River drainage, with the Reticulated to the west and the Frosted to the east, and designated just over 27,000 acres of protected critical habitat for the two species.